NASA's Aqua satellite passed over the Southern Pacific Ocean and captured a visible image of Tropical Cyclone Oma. Oma formed northwest of Vanuatu. On Feb. 12 at 0305 UTC (Feb 11 at 10:05 p.m. EDT) the Moderate Resolution Imaging Spectroradiometer or MODIS instrument aboard NASA's Aqua satellite provided a visible image of Tropical Cyclone Oma. 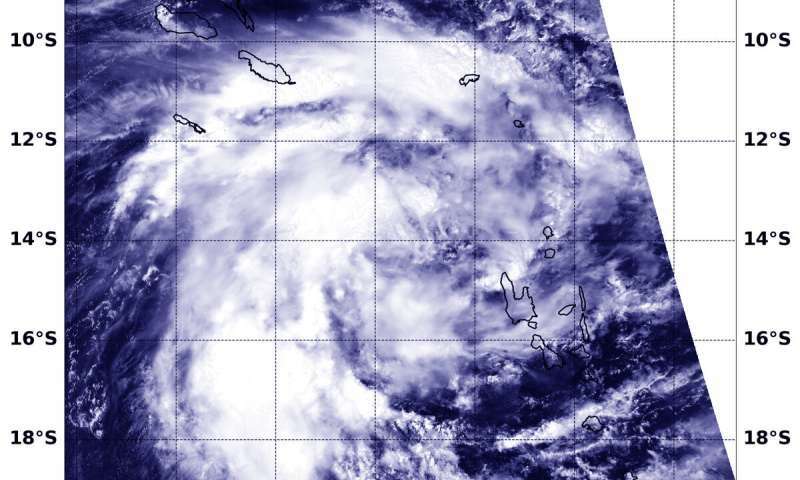 Satellite imagery showed Oma's center between the Solomon Islands to the northwest and Vanuatu to the southeast. The bulk of Oma's clouds were west of the center of circulation. At 10 a.m. EDT (1500 UTC) the center of Oma was located near latitude 13.8 degrees south and longitude 165.6 degrees east. That's about 289 nautical miles northwest of Port Vila, Vanuatu. Oma was moving to the east. Maximum sustained winds were near 45 knots (52 mph/83 kph) and Oma is forecast to strengthen slightly over the next two days before weakening. The Vanuatu Meteorology & Geo-Hazard Department (VMGD) noted "Damaging gale force winds of 75 kph (40 knots) are expected to affect Torba and Sanma today and for the next 12 to 24 hours." In addition damaging gale force winds and very rough seas with heavy swells will affect Torba and Sanma. VMGD also noted "Heavy rainfall and flash flooding over low lying areas and areas close to river banks, including coastal flooding will continue to affect these provinces. The marine strong wind warning and a high seas warning is current for northern and central waters."